The word on the “roofing contractor street” is such that a large PVC roofing manufacturer has problems with their Roof-integrated Solar PV systems. Apparently, the way they designed and installed these solar roofs, the electrical wiring which connects Solar PV panels to the inverter and essentially to the Electric Grid, is overheating and poses serious risks of fire. Since this information is still in rumor stage, and I doubt there will be an official announcement or acknowledgment of this, I for many reasons cannot name the manufacturer, the specifics of the problems or the source. However, there is evidence that it is real. If you are a large roofing contractor in Boston, MA area or in the rest of New England, you are getting the roofing bid lists, such as the Blue Book. 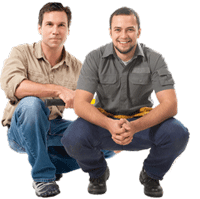 Large commercial and government roofing jobs are a little out of our league, and we get plenty of work without paying huge sums of money for these bid lists (it costs anywhere from $3000/year to get periodic updates). However, in the last 3 weeks I’ve been contacted twice by two different gentlemen from Suffolk Construction. Basically Suffolk is arguably the largest GC in Boston area with $1.57 Billion in sales in 2008, has over 800 employees and are rated #313 of America’s Largest Private Companies by Forbes. The picture below, shows a Solar roof produced by IB roof systems. This roof does NOT have overheating problems, and is intended to demonstrate what Solar Roofing is. In any case, the two gentlemen from Suffolk, asked me to bid a new job in the pipeline of roof bidding lists: A 4,000 squares (400,000 sq. ft.) on the IRS building in Andover, MA, and also they wanted 500 KW solar PV system that would be roof integrated – essentially they were interested in our IB Solar Wise PV system, which in some ways is similar to the one above, but without the wiring overheating of course 🙂 The similarity is in the usage of the UniSolar Thin-Film PV laminates. Other than that, all other components of these Solar Roof systems are proprietary and are very different. So how are the two events connected? It is my understanding that the Solar roof described above was originally specified for this IRS roof, but because of the problems, they started looking for the one that works. Because IB SolarWise is about the only Solar Roof system out there that does not have any problems with it, Suffolk contacted us on two occasions. Aside from the cable overheating and fire hazards, most other flat roofing manufacturers that wanted to use their roofs with UniSolar PV laminates, ran into problems of solar panels delaminating from the roofing membrane. 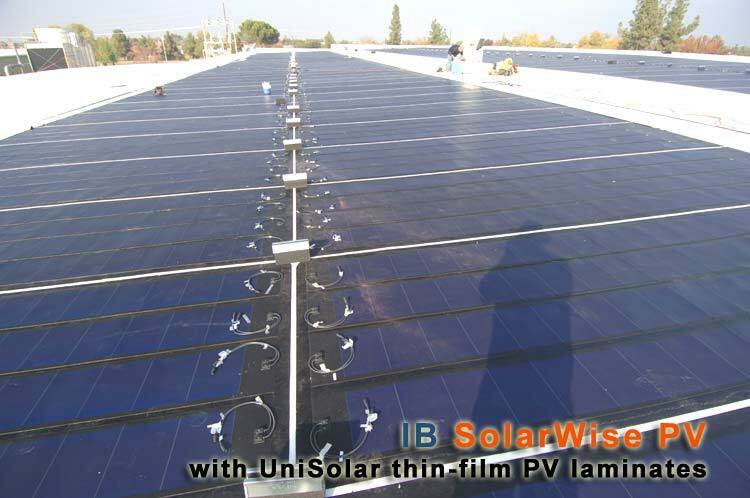 IB Roofs took their time designing the IB SolarWise PV system, and developed a special membrane called IB Solar Shield which is designed to provide excellent adhesion between the PVC material used in IB roofs and the Butyl adhesive on the UniSolar PV laminates. This eliminates the potential of delamination that most (if not all) other roofing manufacturers are facing. The earlier version of IB SolarWise used the solar panels made by Open Energy of California. Later UniSolar panels were chosen as a default integrated PV system, because it allows for greater flexibility for the contractor, system designers and the customer. Today’s IB SolarWise PV systems are made in the following way: IB takes 6×19′ Solar Shield membrane and places 4 UniSolar 136 watt modules using a special process, which insures the proper bond between two products. Then, the whole IB Solar Wise module gets welded to the already installed IB Flat Roof. IB uses regular UniSolar modules with the connectors facing the outside of the module. Although this requires special housing to protect the connectors from UV rays, it eliminates the possibility of cable overheating, as all wires are exposed to the air and are ventilated. This makes IB Solar Wise the best solar-integrated roofing PV system. If you are looking for more information about solar roofing in general, or want to know if solar will work for you, we recommend that you read our Solar PV design & installation guide. Any news on this? I gather the cost for the thin film didn’t drop fast, as the cost for separate modules did. But they would still have advantages. Is anyone still doing them? So — we put on an IBRoof (cool white) to replace our old low slope tar and gravel, in the San Francisco area. At the time nobody offered the related PV, and the old roof here would have to be reinforced a lot to support the weight of the usual PV panels. Not to mention punching a lot of holes in the nice new roof. Is there anyone installing the IB thin film PV in this area? Try Chandler Roofing, or call IB and ask for list of local dealers (approved contractors). Optionally you can get regular solar panels mounted on your IB Roof, without making any penetrations or voiding your warranty, using Anchor Products solar mounts (this company was started by one of IB’s former VPs, who still owns stake in the company, and AP works closely with IB). Thank you. I like this better than the flush-attached type — chance to upgrade as solar PV tech improves, and air space under the PV panels so they won’t transfer heat to the attic. Cool roofing is the fastest growing sector of the building industry, as building owners and facility managers realize the immediate and long-term benefits of roofs that stay cool in the sun. Coolearthcontracting.com – provides full range services and specializes in commercial roofing, epoxy coating and Cool roofs which helps to Reduce up to 15% of annual air-conditioning use. BIPV CoolPly is a PVC or TPO solution that offers greater power density with crystalline laminates and modules as well as thin film technology. It is unfortunate that Open Energy and SIT effectively went out of business this year. However there are better products for commercial buildings that integrate photovoltaics into the building envelope while optimizing both the performance of the roof and the photovoltaics. 303-675-0200 Please call us at SolarFrameWorks to learn more about BIPV CoolPly for membrane roofs. Disagree with me all you want but, as you said, you DON’T have all of the information. Solar Integrated Technologies (SIT) laminated their PV solar arrays to either PVC or TPO sheets which were then hot welded at the seams on the job not laminated as Unisolar is. The NARA building IS an SIT system just Google it. Unisolar purchased SIT a few months ago. You are right that Unisolar has it’s own issues and that is fact. By the way, Suffolk is not the GC for the Andover IRS Service Center either so, they have no business looking for alternative systems as the GC has already been awarded to another firm. I agree/know that Suffolk never got the IRS job. But at the time when I wrote this article (mid June of ’09), they were on of the front runners to get it, and I was contacted by two different gentlemen from Suffolk in regards to a PVC roof / Solar PV installation, because they were interested in IB’s SolarWise PV system (which uses Unisolar laminates). Later I heard that some other GC got the job. I don’t know who it was and do not particularly care, because I was not interested in a job of such massive scale. We are just not capable to handle such a big job. As for SIT using or not using Unisolar pv laminates, I may be incorrect, so please enlighten me. It seems thought, that SIT’s PV panels look awfully similar in terms of physical and electrical characteristics to those made by Unisolar. Once again it is my understanding that SIT purchased Unisolar panels and laminated them to a single ply roofing membrane (i was not aware that they also used TPO roofs). If I’m wrong, who made the PV modules for SIT? Also please share the issues that Unisolar had with their panels. Not sure where Ecdfan got his information from regarding the NARA building in Waltham because, the blog link references Unisolar even though this job is a Solar Integrated project. It is true that Unisolar purchased Solar Integrated recently. However, the blog was written before the purchase had taken place so, his information is misleading and inaccurate. I have to disagree with you however. Solar Integrated (SI) was using Unisolar Thin-film Solar PV modules, that were adhered to a pvc roofing membrane. SI had an “exclusive” contract with that PVC maker to market and sell the PVC roof with Unisolar PV modules. It is my understanding that later this PVC manufacturer began to market their own Roof-integrated PV systems with the same Unisolar panels, while still working with SI. (just to be fair, do not quote me on this info – I did not do any extensive research – it is just the way I know things from different sources). In any case both Solar Integrated and this PVC manufacturer had certain problems with the whole system, and it is no longer “welcomed” in Massachusetts as well as most other places. Of course, Open Energy (aka Applied Solar) had their own nice fire in Simi recently, no wonder they are filing for Ch 11. Oh, and by the way, are Unisolar laminates IEC 61730 compliant?